To overcome concerns relating to IT, security, and compliance, enterprises must go a step further and adopt a cloud-based content services strategy—but why? 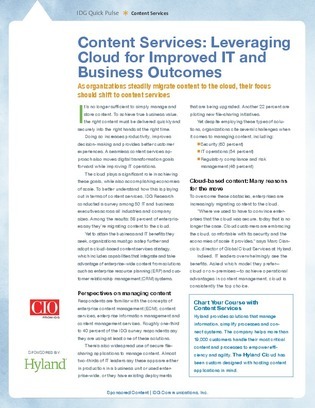 Provided in this white paper, uncover the many reasons why organizations are moving their content to the cloud. Explore the operational advantages of a cloud-based content services platform, and discover why IT leaders prefer the cloud to on-prem for content related tasks.